To keep the cross-pollination going between the two shows, TNA President Dixie Carter appeared on the MMA show Bellator to drop some news about TNA. 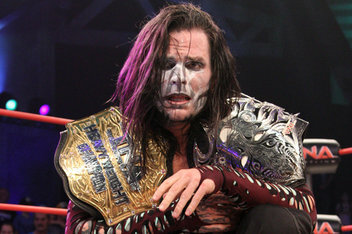 First, and most important I’d argue, Carter announced that their World Champion Jeff Hardy has signed on for an additional two years locking him up and preventing him from making the jump to the WWE without having ever lost the title. A very smart move on TNA’s part to sign Hardy as he continues to be a license to print money for them, no matter how much some of us hope he loses the title soon (maybe now that the contract is signed…). Two decent-sized news bites for Carter to break on Bellator and more importantly I’m glad the MMA fans now also get to suffer this forced co-promotion between the two. 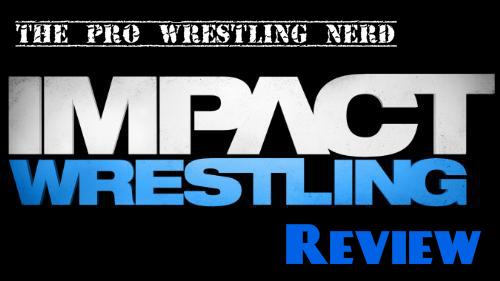 This week on IMPACT Wrestling Bully Ray pleaded for his reinstatement, Kurt Angle called out Mr. Anderson, Kenny King and Zema Ion tried to one-up each other, and in the main event Jeff Hardy defended the TNA World Heavyweight Title against Christopher Daniels. Click “read more” for quick match results as well as a breakdown review of the episode. For a more detailed recap, check out my coverage over at 411Mania.